I am very excited to host a stop for The Paper-Pieced Home Blog Tour by my dear friend Penny Layman on my blog today! I feel I've said this so many times already, but I just love Penny and everything she makes!! 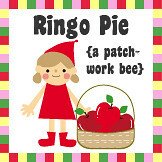 I don't know if I had discovered the joy of paper-piecing if she had not kindly invited me to co-host our Ringo Pie bee years ago where we designed and made a paper-pieced block each month with super talented gals. I fell completely in love with paper-piecing techniques, and as of today it is by far my favorite sewing technique. So you can imagine my excitement when I heard about her writing her first book full of her original paper-pieced block designs!!! I knew her book would be amazing, but it even exceeded my expectation. How could that be possible?! It has so many amazing patterns and there is a CD inserted with all full sized patterns! When I had to choose a project for this tour, it was so hard because thought I could make literally anything in this book joyfully!! So I ended up sending a long list of projects I want to make and had the coordinator pick one for me from it :) I am happy this Allie-Gator Block was selected, because he is super cute, and I just needed to start making a quilt for my nephew to be born next month! This is my first time to see my sister being pregnant, and I am beyond excited to welcome a boy in the family! Both my sister and her husband are big eaters! My sister is already concerned about food expense since she expects her son to be a big eater like them. I somehow wanted to include some food theme in this quilt, so I modified the pattern between the alligator's teeth just a bit only so I could fit in some chocolate cake and a cherry. And then, I thought I want to incorporate more of food stuff into the quilt so I made the patchwork border around it. (Each square is 2 3/4" finished) This turned definitely too busy for my sister's taste. She likes things soft and quiet, and that's why she never seems to appreciate anything I've made for her lol. Well, it may be the case this will be another thing she won't like very much, but I bet her son may like it. I think I will embroider his name above the cute alligator's head or applique because the white part seems a bit too strong to me. Then I will probably hand-quilt just like Penny did for hers in the book! Oh I should mention that Penny offers this Allie-gator patterns in two sizes. I picked a larger version. 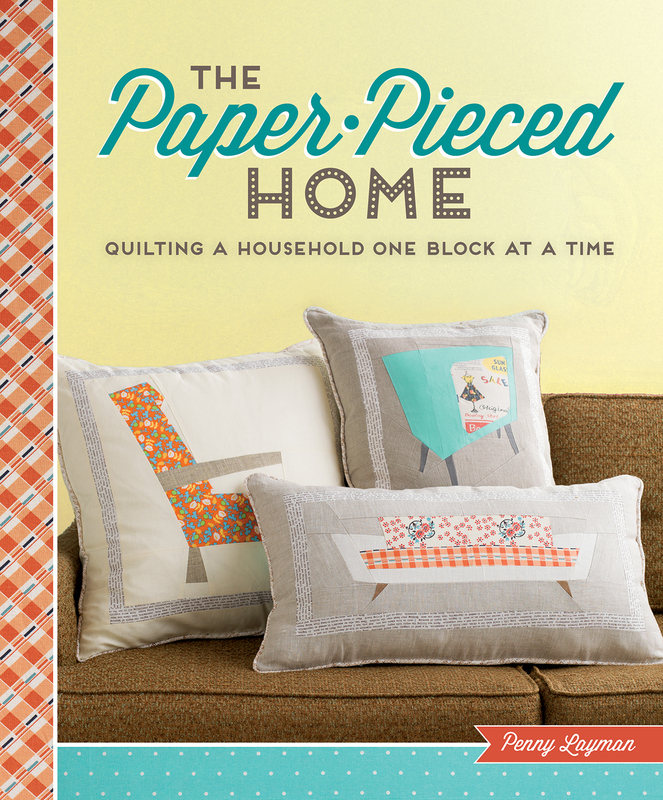 If you love paper-piecing and all things retro, you will covet this book like myself, I promise! This may become one of my very first book that I make everything from!! Here is the schedule for this blog tour. Go ahead and be inspired by all the amazing things these talented ladies are making from this awesome book! 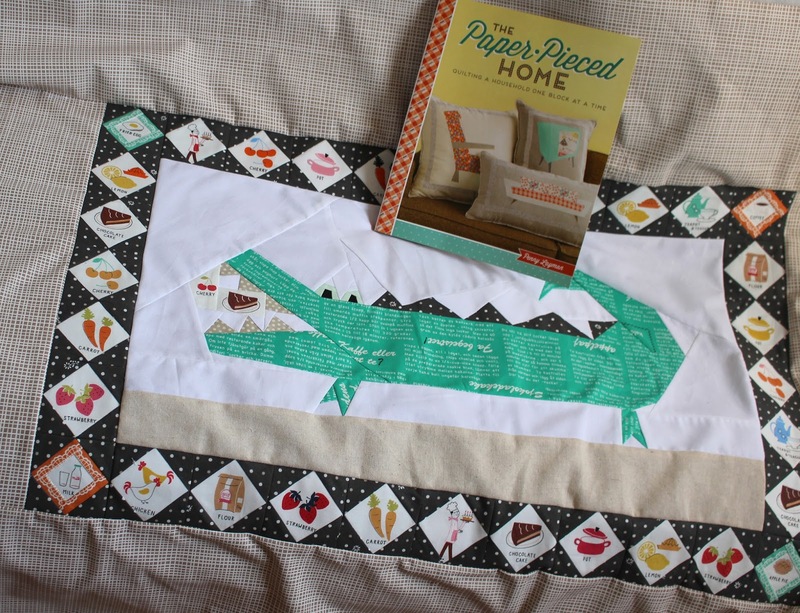 Would you like to win a copy of The Paper-Pieced Home? If so please leave one comment by the midnight of March 31st! A lucky winner will be announced on the following day! Adorable Allie-Gator and daughter too. Wow, the gator is super cute! The more I see from this book, the more convinced I am that I would make many things from it! Fingers crossed that I win, thanks for the chance. Adorable model for your photo shoot, too. it's so darling Ayumi! And precious Honoka!!! She is so so cute!!! I love that age, everything is so much fun. And I love that you mix languages, she'll be one smart cookie! HELLO, Thank You for a neat post! Love your projects! Thank You for sharing a giveaway too! That book looks like so much fun! Thanks for sharing. so cute! & perfect made up in your lovely fabrics. 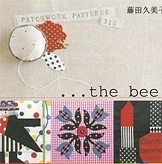 I love everything what Penny makes too:) and it's good that she wrote a book dedicated to paper-piecing. I'm sure that this book will encourage more people to start their own paper-piecing adventure! PS. I love love love your aligator and all the fussy cuts around him! Oh I love the alligator and the pieced border! I am sure the young boy also will love it!!! I am having so much fun following this blog hop! I love your choice of fabrics for this block. Your sewing is awesome as always :) But your little daughter Honoka is sooo cute :) Have a nice time! What fun to see that allie-gator. The pattern makes a great pillow. Thanks for the chance to win the book. This looks to be a fabulous book. I have followed the blog hop and there are some lovely things to make. I like how the alligator is eating his lunch! My comment seemed to disappear! The book looks fabulous. I followed the blog hop to see all the lovely ideas with the patterns. I like the alligator eating his lunch! So far, I've enjoyed all the patterns I've seen in the blog hop! I love yours, too! I'd love to win a copy. I think the alligator might be my favorite block in the book and your food themed version is completely adorable! I was very lucky to meet Penny at Quiltcon recently, and you're right, she is so lovely!! Such a lovely project... I love the idea of quilts for vocabulary building in little people. I'm planning an I Spy Polaroid quilt for my littles. P.S. I don't think there's any issue with you speaking two languages to your little one. She'll sort out what belongs where. It's a huge brain advantage for her to be bilingual! Ayumi, it's lovely to see this post from you. Your friend's book looks like an excellent motivator and inspiration for folks to try paper piecing. I must tell you that the allie-gator quilt is quite clever, and almost, almost as cute as your darling Honoka. I think it's wonderful that she's learning two languages simultaneously, with joy and intuition. I have cousins who grew up in Argentina, with fluency in English, French, Spanish and Portuguese. What a lovely mix, don't you think? Love Allie and his food choices. If you sister does not like this because it is too busy, I think you daughter will be happy to claim it for her own. I would love to own this book. Love to paper piece and retro is my favorite. Love this and your fussy cut blocks are a great touch. I love making paper pieced blocks! I recently made a witch potholder (after Halloween, but there's always next year! ), and always enjoy seeing how it all looks once it's done. I need more practice, and this book could be just the boost I need. I love your alligator quilt (and I love how you added in some pieces of food in his mouth). I never would have thought to make one pieced block the center of a quilt, but now you've given me plenty of ideas! I'll definitely be checking out the other projects on the blog tour! See cute! The quilt too! Stunning work and would love to make some beauties from the book. Thanks for the chance! Love the alligator! What a fabulous quilt for a kid! Your alligator is just beautiful..love the colors of your quilt. Your daughter is just beautiful. Thanks for sharing. Love the gator, lol. So cute. If your sister doesn't like it, I'll take it! I'm sure your sister will love the quilt, as will the baby! It's very cheerful and fun. Thanks for sharing your project with us! The book looks darling...though it can't compete with your daughter. :) And how fun for your nephew to have a quilt made from fabric you designed. Love all around. It's hard to decide which is the cutest; the alligator, the border, or your daughter! I will have to vote for Honoka, but that is a very very cute alligator. And I love the border, too! Love the alligator and the fabric on border. Would love the book. 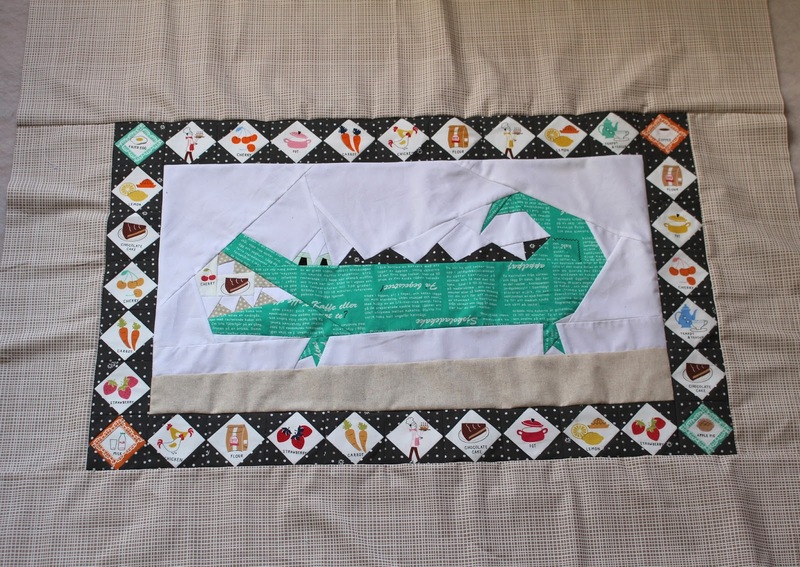 Your alligator quilt is great, so creative! I've always enjoyed your projects, they open up new ways of quilting to me. Thank you for hosting the giveaway! Your daughter is so cute, and love the alligator quilt. Thanks for sharing! Your daughter is oh so cute! Thank you for the chance to win this book. Thank you for introducing this lovely book and sharing these happy and sunny photos! I love Allie-Gator. This would be so adorable for my grandson. I always tell him See You Later Alligator when we say goodbye. A fabulous looking book! I love the alligator eating his lunch. So many lovely things to make. Wonderfull to look - I love it so much! Thanks for the cahnce to win!! Alli-gator is perfect for a boys quilt! It's nice to have such a variety of patterns come together in a book like this. Thank you for the chance to win it! It's a wonderful quilt for boys and girls alike. I LOVE the food going into the alligator's mouth! I bet your nephew will love it. Honaka is such a Dolly! I love the alligator block! I can make it right away since I have yards of your Swedish Chef fabric. I love that fabric! I hope I win the book because I love paper piecing. Love your alligator! Thanks for the chance to win the book. Love rhe alligator, but also the girl playing on top of it! My sons are older and play outside a lot. I could use the book for cool patterns and ideas! 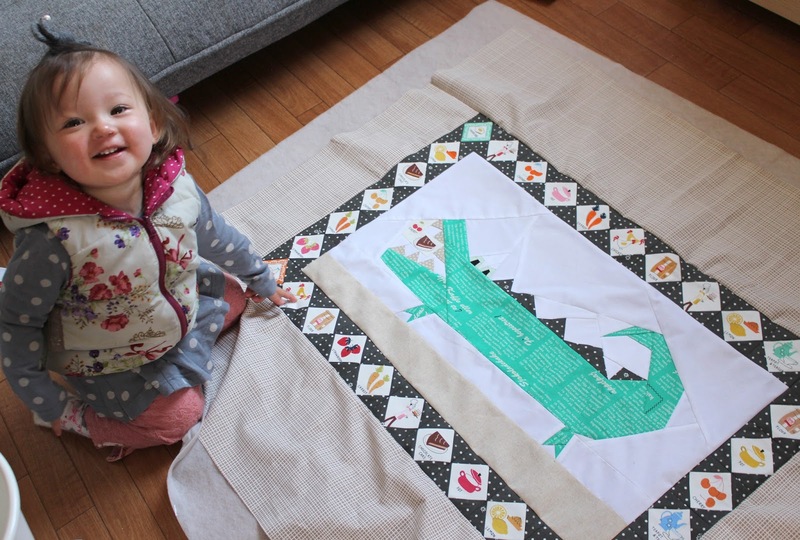 Such a darling Alli-Gator quilt and little Honoka is equally darling! Love the blocks around the outside too ~ darling all around! Thanks for the chance to win Penny's brilliant book! 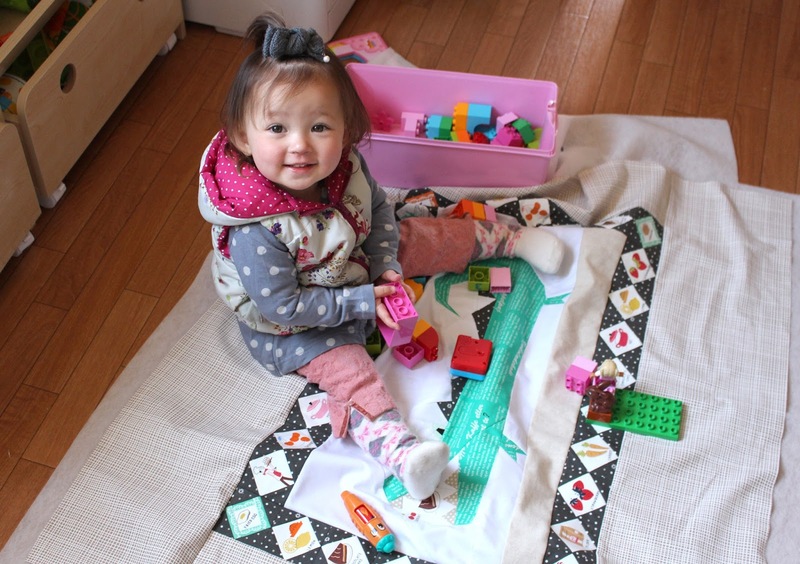 Oh my gosh, Ayumi, between this adorable pattern and your adorable fabric, this quilt is amazing!!!!! And it's lovely to see Honoka looking so happy! She's such a doll... I'm super impressed with Penny's book, too, and I love that it comes with a CD for easy printing and pattern re-sizing. Thanks for sharing your beautiful work with us! ACK! This is so cute! What a fun present for your nephew to be! It will be hours of much entertainment for him I'm sure! I snaffled this book up pronto on pre-order (I don't need to win, I just had to tell you how much I loved your block!) I haven't made anything from it yet. But I will! I have my eye on the viewfinder. So fun! I've never tried paper piecing before. This would be great! What a cute alligator and he doesn't look scary. Love the colors. I would like to make the alligator a pillow for my nephew. This looks like a fun book, and you chose a great way to use your block. I love how you made the alligator eating cake and cherries! I love paper piecing. Thanks for the chance to win. Cute treatment of the Alligator, fun baby quilt! I am so glad you posted while I am in Japan. I've enjoyed my stay in Kyoto and Awaji Island and all the fabric shopping. Love your alligator chomping on some sweets. My friend's household speaks mostly english at home and japanese at school and while shopping. Your nephew's quilt is going to be wonderful! And Honoka is a cutie-pie! I love the quilt! How did your little girl get so big already? She is adorable! This book is great! I surely would make all 40! I love them all that I have seen in y'all's hop! Awesome jobs! That is darling! I love that there are so many different types of blocks. Animals, kitchen stuff, etc. And I love paper piecing, what a fun book! Love your alligator. Sew cute!! As is your daughter!! Your daughter is adorable! I like the alligator, too. Your nephew will become attached to it, too. I'd love to win the book. Thanks. Adorable block and your daughter! thanks! How clever to add the food theme to the large alligator block. I am sure your nephew will love this quilt! So exciting to have a new nephew on the way. I have three daughters and three nephews! I love the alligator quilt you are making to welcome your nephew. I love your alligator and I am sure your sister will too! Are you sure you will not need to make another one for Honoka? I'm not sure what happened, but my comment didn't show I hope this is not a duplicate. I really love this book and will probably add it to my quilting library. Thank you for the chance to win! I think your alligator quilt with the food fabric is a great welcome to your nephew. Your daughter certainly approves. That food fabric in the border is so wonderful! I follow you since 2 months ago and I love your blog. I hope you continue doing your best in sewing. You are really inspiring!!! This looks like such a great book and I love your alligator! 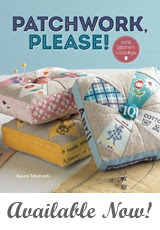 I would LOooove to win a copy of this book so I can give paper piecing a try! Your little girl is so sweet and seems to love your alligator. How about stitching a few flies with a trail above the alligator's head, along with a name? That would be so cute! nike roshe run sale speak of things, talk to your greeting each other nike roshe run australia like old friends in general, nike roshe run sale I really do not know these cheap nike roshe run shoes people are not official spent a long time to develop problems, do not actually did not know. nike roshe run sale Drink nike roshe run sale plenty of water to drink. Great gator! Love your model!! she is cute! Lovely pic, Honoka is growing so fast!